Needle-Free Flu Shots Now Available! Needle-Free flu shots are safe, fast, and most patients choose them. Because there is no needle involved in the PharmaJet Needle-Free flu shot, there is reduced risk of needle stick injury, cross-contamination or needle re-use. Most providers are self-trained in 20 minutes. Why are Needle-Free Flu Shots Important? The Centers for Disease Control and Prevention (CDC) recommends annual flu shots for all adults, however, immunization rates have hovered around 40 percent for the past five years.1 The US Department of Health and Human Services (HHS) has established a Healthy People 2020 campaign that includes the goal of 70 percent flu immunization compliance by the year 2020.2 A significant percentage of people forego vaccinations because of an aversion to needle injections.3 PharmaJet’s needle-free flu vaccine delivery can contribute to meeting the influenza immunization goals of the CDC and HHS. 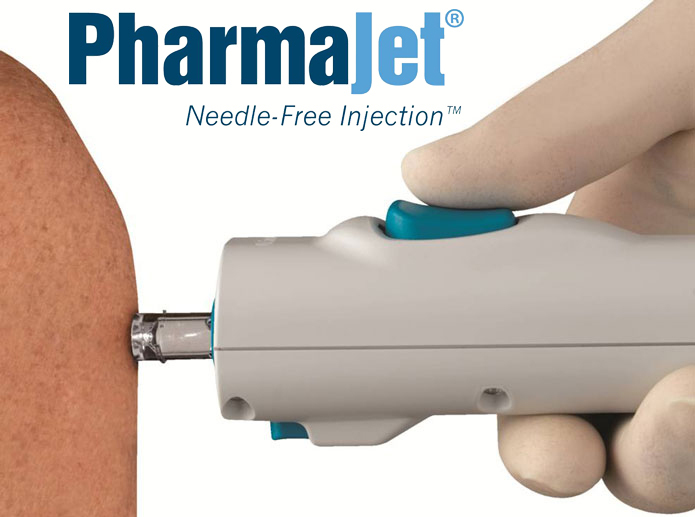 The PharmaJet Needle-Free Injector delivers 0.5mL injections to the intramuscular tissue depth. The PharmaJet syringe filling is compatible with standard multi-dose vials of AFLURIA. AFLURIA is a registered trademark of CSL Limited used under license. bioCSL is a trademark of CSL Limited. bioCSL Pty Ltd. Is a subsidiary of CSL Limited. “Flu Vaccination Coverage, United States, 2013-2014 Influenza Season.” Centers for Disease Control and Prevention. “Immunization and Infectious Diseases.” HealthyPeople.gov.